How many construction jobs are there at the Atlantic Yards site? In mid-November, Forest City Ratner told the New York Daily News and Patch that there were 779 workers on site at the end of the previous week, November 11. However, the most recent report on arena construction, prepared by Merritt & Harris, the real estate consultant to the arena PILOT Bond Trustee, cites only 415 workers. The report, dated 12/2/11, is based on a 10/27/11 site observation. Given that 415 was the number in the report a month earlier, it's possible the report was not updated. (I asked Merritt & Harris, by email and by phone, for clarification, but didn't get a response.) And the Merritt & Harris report excludes workers at the railyard. Still, there's a huge discrepancy between 779 and 415--or 415 plus railyard workers. In fact, it's possible that, despite seemingly declarative statements, Forest City Ratner is using a different calculation: cumulative workers rather than workers at the site. At the 7/14/11 meeting of the Atlantic Yards District Service Cabinet, Forest City Ratner officials used two different descriptions. 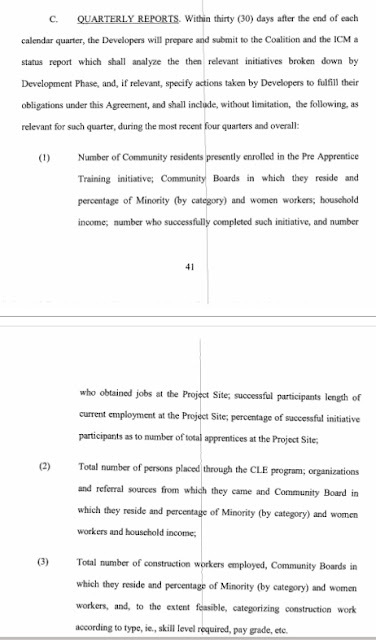 Of 430 workers, "180 of those are Brooklyn residents," declared executive Sonya Covington, implying that there were 180 Brooklynites currently on site. However, at another juncture, executive MaryAnne Gilmartin said there had been 180 Brooklyn residents "since construction began," which implies a cumulative number and suggests a much smaller current total. Who could clear it up? There's supposed to be an independent source of such numbers. Forest City Ratner was supposed to hire an Independent Compliance Monitor, at up to $100,000 a year, to monitor compliance with the Community Benefits Agreement. It never did. According to Article XI, section C of the CBA, (see p. 41, and excerpt at right), Forest City is supposed to report local hires, total number of construction workers, and more both to the CBA coalition and the Independent Compliance Monitor.